Star Wars VII is now filming and fans are in a froth. The good news (or bad depending on your point of view) is that gossip site TMZ seems to have someone on the payroll on their payroll. 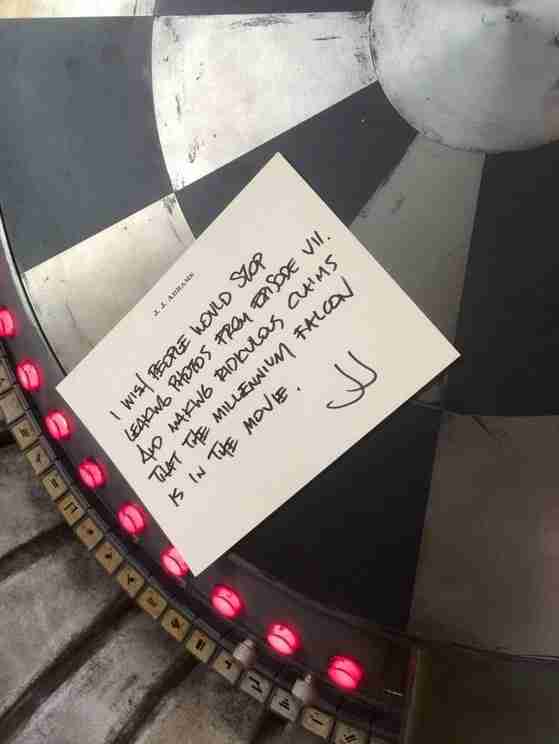 J.J Abrams posted the above photo online . He’s playing around – why? If you don’t know then you’re reading this article for all the wrong reasons. Hint – it involves the Millennium Falcon . In other Star Wars news – 12 Years A Slave actress Lupita Nyong’o and Game Of Thrones star Gwendoline Christie have joined the cast of Episode VII. Meanwhile, Chronicle director, Josh Trank has been hired to direct an unknown Star Wars spin-off movie for Lucasfilm/Disney. That’s a lot to digest!